Ten years earlier I’d sat in the British Library, reading With Fond Regards, an edition of letters selected from archives in the National Library of Australia. I had a scholarship to live in London for three years and write my doctorate on expatriate writers and I was looking for inspiration. As I turned the pages, I chanced upon Rosa Praed’s letter to her stepmother, written from London at the outbreak of World War I. Although its account of German spies didn’t interest me, I knew Praed was an expat. When I checked the catalogue I found she had been a prolific writer, publishing some fifty books between 1880 and 1931. I rubbed my eyes, made a note of the letter and decided to call it a day. A week later the biography I’d ordered, Rosa! Rosa! by Patricia Clarke, arrived in the mail. Rosa was born in 1851 at Bromelton, a property beside the Logan River in Queensland. The family moved between Brisbane and other properties bought and sold by her father, Thomas Murray-Prior. She was educated by a governess from age eleven until fourteen, and by her mother, who died of consumption when Rosa was seventeen. After her mother’s death, Rosa acquired a degree of freedom unusual for a woman of 1860s Australia, accompanying her father to Brisbane for his political business and running the house in the Queensland bush. Her marriage to Campbell Praed cramped her, particularly after they moved to the remote, barren Curtis Island off the coast of Queensland. By the time the Praeds sailed to London in 1876, Rosa had realised that she was sexually and intellectually incompatible with her husband, and things were unravelling. With a rush of excitement, I realised that one of the houses in which Rosa had lived in London, 16 Talbot Square, had been destroyed and was now occupied by the concrete bunker that was my residential college. Praed Street, the main street of Paddington where I stepped off the bus, had been named after Campbell Praed’s ancestor William Praed. I discovered Rosa also had a daughter, Maud, who was deaf. When I was nearly four years old, a random shred of bacteria floated across our farm in north west New South Wales and into my body. My senses became inflamed. The morning light bit my eyes and the breeze became a blade scraping my cheeks. I complained to my mother of pain dripping down the back of my neck. At first she thought it was the flu, but a sense of disquiet nagged. She changed from her farm clothes into a skirt and blouse. We drove over rough gravel roads to the local doctor, half an hour away. When the doctor saw me, his movements became quick and urgent: I was to go to Tamworth Base Hospital immediately. My mother drove for another hour. At the hospital she watched in horror as, holding me down, the doctor pushed a needle into my spine. Results confirmed it was meningitis. I was given a massive dose of antibiotics to kill the infection. After that, there was nothing to do, but wait. A few hours later my father arrived. My parents sat by the bed in the darkness while I had a respiratory arrest. In the morning, my eyes opened: ever-combative, I had won. A few weeks later, they realised that something wasn’t quite right. ‘She keeps asking me what I’m saying,’ my mother said to my father. We went back to the local doctor and then to an audiologist. Hearing tests confirmed that I’d lost 75 per cent of my hearing: I had no hearing in my left ear and half in my right. The large dose of antibiotics injected to cure the infection on the lining of my brain had saved me, but it had also damaged the nerves of my cochlea that transmitted sound. It isn’t clear how Maud Praed became deaf. She was born in Brisbane on 8 February 1874 but her mother didn’t think she had been deaf at birth, remarking in a letter to her stepmother that Maud had once ‘started at the slam of a door’.2 She conjectured that Maud might have lost her hearing when they were living on Curtis Island off the coast of Rockhampton. As Clarke relates, Rosa had noticed an unpleasant smell coming from her daughter’s ears, but instead of taking Maud, who was four months old, to a doctor across the strait to the mainland (which would have been difficult), she syringed Maud’s ears. When the smell cleared she thought nothing more of it.3 Clarke also notes that there was an episode of illness when Rosa was staying with Maud in Toowoomba, although Maud’s medical notes from 1902 state that she had ‘been stone deaf since a severe attack of ScF [scarlet fever] in early infancy’.4 Maud’s deafness was discovered when she was two years old, just before the Praed family set sail for England. Her uncle rang a bell near her ears, and she didn’t react. As a young woman, Rosa had access to her father’s library and was a knowledgeable observer of his involvement in politics, but her limited education would not have prepared her for raising a deaf child. 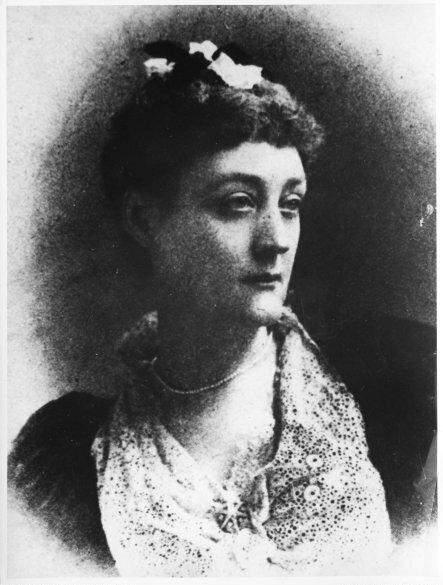 Her first thoughts on arranging Maud’s future were ‘if it should be that she was born deaf we must have her taught at Home.’ She resolved that ‘As soon as we get to London we shall take her to a good aurist and learn the truth’.5 In 1880, four years after their arrival in England, Rosa decided against home tutoring and enrolled her six-year-old daughter in a school run by a teacher training college, the unwieldy-named Society for Training Teachers of the Deaf and the Diffusion of the ‘German’ System at Ealing, London. This school was established in 1878 by Benjamin St John Ackers, a British Member of Parliament whose daughter was deaf. Wanting to give her the best education possible, he visited schools in Europe and America, returning to England a firm believer in the ‘German’ system. This method, more commonly known as ‘oralism’, taught deaf children to speak, as opposed to the ‘French’ system, which taught them to communicate using sign language. Such attitudes towards breeding were influenced by the publication of Charles Darwin’s The Origin of the Species in 1859, which destabilised the boundary between animals and humans. Jennifer Esmail notes that ‘in Victorian Britain, and beyond, signed languages were often (mis)understood as a “primitive” mode of communication, one that might even be accessible to animals, thereby destroying that fortification of human uniqueness built on our ability to use language’.8 Deaf people who signed, it was reasoned, were closer to animals than humans. This association of deaf people with animals was by no means new; it is as old as the cultural history of deafness in the west. Initially, it was believed that deaf people were more like animals because they could not hear the word of God. The Church also claimed that to teach deaf people speech, let alone educate them, was a contravention of God’s will. This conviction continued for close to two thousand years, until sixteenth-century Spanish monks such as Fray Pedro Ponce de Leon discovered, in teaching the children of aristocrats, that deaf people could learn to speak. Later in France, philanthropist Abbé de l’Épée chanced upon two deaf sisters signing in the Parisian streets and in 1760 he founded the world’s first free school for the deaf, the Institution Nationale des Jeunes Sourds de Paris. The efforts of men such as de l’Épée unleashed a renaissance in deaf communication. They demonstrated that the deaf were not subhuman, but were being instructed in an impossible language: speech. But towards the end of the nineteenth century deaf people who signed began to lose the advances they had made as oralism once again held sway and they were encouraged to use this far more difficult method of communication. In Rosa’s novels, there are clues that suggest her receptiveness to ideas about breeding. Almost every female protagonist in her oeuvre is referred to in terms of their provenance, which is usually upper class. In her first novel, An Australian Heroine, her main character Esther is described as ‘high-bred in every line’.9 In her last, Soul of Nyria, her protagonist is a German princess, albeit now enslaved in ancient Rome. In 1884, Rosa edited a volume, For Their Sakes, to raise money for Maud’s school. Benjamin St John Ackers, the founder of the school, contributed an essay in which he wrote ‘[i]f the deaf are unable to mix comfortably with hearing persons, they will naturally shrink from them; be drawn to others like themselves; marry those similarly afflicted and so, alas, too often hand down and increase the evil’.10 That Rosa sent her daughter to a school run by a man who espoused eugenics suggests that she was no stranger to the concept. When I began school in 1983, my parents didn’t have Darwin or eugenics on their mind. Rather, they had two choices: to send me to the local primary school with my siblings and cousins, or to have me board at the school for the deaf in Sydney, an eight-hour drive away. I was too young to board and my father was a farmer who couldn’t move us to the city. I was also talking before I lost my hearing. The point at which a person becomes deaf has a direct impact on the way in which they speak. For someone who is born deaf, learning to speak is a time-consuming process because they need to rely on their sense of touch rather than hearing. Donna McDonald, author of The Art of Being Deaf, has been profoundly deaf since birth and was taught to lipread and speak. Her mother, she writes, ‘pressed my hand against her lips so I could feel the expulsion of air shaping letters, and as she played my fingers against the pulsing of words bubbling up her throat … I was coaxed, dragooned and persuaded into the world of hearing’.11 Given the amount of effort this requires, it’s usually easier to learn to sign. As I had some speech and a residue of hearing, I was able to get by in a hearing school. A teacher for the deaf visited me once a week to check that I was on track with my school work and to help with my speech. Although it was relatively clear, I still had difficulties. ‘My brother and I found a dead ibith in the paddock,’ I said to my teacher. Eventually, with her help and the repeated work of my parents, any trace of a speech impediment was removed from my voice. These days, people can’t tell I am deaf unless I explain it to them, although the trained ears of speech therapists can still find the lisp lurking in some words. This means that it’s hard for people to understand that I have a disability. If I tell them that I’m deaf, they forget within a few minutes, or underestimate its severity. They don’t see the hours of effort that I have put into speaking well and making myself a sociable creature. They wouldn’t believe that, for two decades after I became deaf, I was frequently isolated and lonely because I didn’t know what to say to people. My parents coached me on making small talk, but I couldn’t understand the point of expending so much effort and anxiety for a chat about the weather. Instead I sat alone on the cold steel benches at lunch, the crusts of my sandwich scraping against my throat as I swallowed. If it took a few years to attend to a relatively simple speech impediment, one can imagine how much harder Maud must have found it to learn to speak. She, too, was lonely. Eliza Lynn Linton, an astute friend of Rosa’s, suggested that Maud might be happier with a deaf companion than her teacher.12 Without friends, she was close to her mother, and in letters she frequently conflated Rosa’s voice with her own. In an undated letter written when Maud was in her late teens, she complained of ‘our present companion, as she talks and talks all the time, and makes such a fuss over a petty fault. In order to get rid of her, we are going to Cannes, and it may be a good excuse for her to go away. Mother and I feel quite sure that we should be happier if we are alone, and go about together’.13 Maud may have found the companion tiring because she had to concentrate on her voluminous speech, while her use of ‘we’, the adoption of her mother’s feelings, and the reference to future time spent together, indicates how closely Maud aligned herself with her mother. One can understand, then, her jealousy and distress when her mother met a woman who displaced Maud and her affection. After her first book, Rosa published novels on a near-annual basis. Her success as a writer vaulted her into London society, where she found kindred spirits with whom she had more in common than her husband. One was Alfred Sinnett, who shared her interest in theosophy, a doctrine which espoused reincarnation. Sinnett contributed to Rosa’s volume For Their Sakes and told Rosa about Nancy Harward, a young woman who had the capacity, while under hypnosis, to take on the persona of Nyria, the German princess enslaved in Rome. Nancy wanted to move to London to further her writing career and Rosa was interested in her proof of past lives, so Sinnett arranged a meeting in 1899. There was a mutual attraction between the two women, and six weeks later Nancy moved in with Rosa, by then separated from her husband Campbell. Rosa’s instantaneous bond with Nancy aggravated Maud’s mental health, which had already begun to deteriorate. She avoided Nancy by staying with her father at his house in Northamptonshire for extended periods.14 In 1901 Campbell Praed died suddenly and Maud, already destabilised by her mother’s new relationship, was precipitated into madness. She was convinced that she was accused of killing her father and that police were spreading reports of scandal about her. Her mother, ill and stressed, could not cope with this development. In September 1902 she had Maud admitted to Holloway Sanatorium at Virginia Water, Surrey. Maud’s letter, nestled among her case notes, was written three years after her admission. That it opens with an account of her mother’s perceived hostility shows how much Maud was affected by their separation, even then. Her disability also contributed to her distress. After her admission to the sanatorium, her doctor observed, ‘Her deafness prevents her to a great extent from taking part in the community of the Hospital but she occupies herself with needlework & plays chess well.’15 Lonely and locked into an unsettled mind, it would have been extremely difficult for someone to explain to Maud what was happening and to console her. Although Maud’s letter is a mixture of reality and delusion, the mere fact of its existence shows that she was desperate to communicate. Maud’s doctors noted that she ‘speaks slowly and with some difficulty, though she articulates correctly’, indicating that speech did not come naturally to her. Writing would have been easier for Maud than speaking, particularly as from early on Rosa encouraged Maud to keep notes in a pad that she used to carry a conversation.16 Having seen her mother’s success with writing, Maud might also have imagined that writing was a medium through which one could access fame, success, and even freedom. From when I was small, I wrote letters to my relatives in New Zealand and to my Singaporean penfriends, obtained through the pen-friend postcard dispenser at the Australia Post pavilion at Expo 88 in Brisbane. Writing was a way for me to communicate when I couldn’t hear on the phone. It was also, crucially, a means for me to express the frustration and anxiety that came with my disability. When, in my final year at school, a careers advisor suggested creative writing at the University of Wollongong, I knew immediately that this was what I wanted to do. Yet it wasn’t until 2010, after I had finished my doctorate in London and returned to Australia, that I discovered my affinity with writing was the exception rather than the norm. My boss had told me about the incredible lipreading skills of her friend Donna McDonald, who was then completing her PhD at the University of Queensland. I dropped Donna a line and she suggested we meet for coffee. On a bright and humid day at the St Lucia campus, we sat in the sporadic shade of some palms. It was the first extended conversation I’d ever had with another deaf person. This was astounding. To me it was logical that one should turn to books and writing when listening was so hard. I quickly realised that Donna’s observation made sense. For those who sign, writing is foreign because sign language has no written counterpart. Spoken English also has tricks tucked into it that don’t correlate with what is on the page. There is also resistance to using a language, as Jennifer Esmail has pointed out, that ‘carries its own pejorative resonances for terms such as deaf, dumb and mute’.17 Even Maud was aware of these associations. In the letter to her doctor she wrote, ‘Perhaps it might interest you that my hearing is coming outright’, suggesting that she knew that to hear well—either immediately (outright) or correctly (out right)—was a prerequisite to being healthy. Maud was not impervious to the concept that to be deaf was to be deficient. Despite the difficulty of English, Maud had no other means of communicating, and so she picked up a pen. Her letter, nestled among the account of her troubling decline, is priceless. It illustrates that deaf people have always had their own voice, but it may be secreted in footnotes, while those who sign have had no way of recording their language prior the advent of photography and film. It also shows that, when deaf people speak, their voices are rarely received. Maud’s certainly wasn’t. She died in the asylum on 8 July 1941. Her death certificate lists the causes as syncopic (fainting), chronic myocarditis (an inflammation of the heart muscle) and artero sclerosis (now known as antherosclerosis, a build up of plaque in the arteries). She was 67 years old and had been in the sanatorium for 39 of those years. She outlived her entire family. Her 1905 letter, the voice of a young, deaf woman obviously unhappy and longing to be home, was never delivered. Instead it reaches us, over a century later, to remind us that deaf people can speak in a range of ways, and that we must listen harder to hear what they are saying. I am grateful to Arts Queensland for their provision of an Individuals Fund Grant to assist me with researching this work. 1 Maud Praed to Dr Moore, 27th September 1905, Surrey History Centre, Case book, 3473/3/6. 2 Rosa Praed to Nora Murray Prior, 8th February 1878, Murray-Prior Papers, Box 5, Folder 33, 19/35. 3 Patricia Clarke, Rosa! Rosa! A life of Rosa Praed, novelist and spiritualist, Carlton South, Melbourne University Press, 1999, p. 40. 4 Surrey History Centre, Case book, 3473/3/6, page 437. 5 Rosa Praed to Nora Murray Prior, 8th February 1878, Murray-Prior Papers, Box 5, Folder 33, 19/35. 6 Alexander Graham Bell, Upon the Formation of a Deaf Variety of the Human Race, Washington: National Academy of Sciences, 1884, p. 4. 7 H-Dirksen L. Bauman, “Introduction: Listening to Deaf Studies” in Open Your Eyes: Deaf Studies Talking, edited by H-Dirksen L. Bauman, 1–32, Minneapolis, University of Minnesota Press, 2008, p. 11. 8 Jennifer Esmail, Reading Victorian Deafness: Signs and Sounds in Victorian Literature and Culture. Athens, OH, Ohio University Press, 2013, p. 102. 9 Rosa Praed, An Australian Heroine. London: Ward and Downey, 1890 , p. 7. 10 Ackers, Benjamin St John. ‘Deaf not Dumb. A lecture, etc’, in For Their Sakes, edited by Rosa Praed, 38-53, London, Chapman & Hall, 1884, p. 41. 11 Donna McDonald, The Art of Being Deaf: A Memoir, Washington, Gallaudet University Press, 2014, p.55. 13 Maud Praed to Thomas Murray-Prior, undated, Murray-Prior Papers, Box 3, Folder 17, 15/55. 15 Surrey History Centre, Case book, 3473/3/6, page 437.